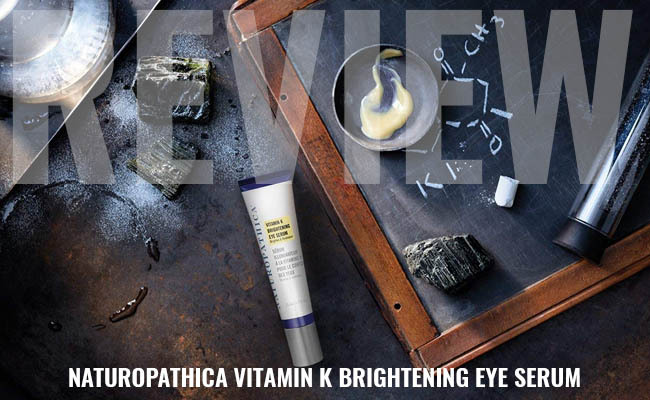 Why use Naturopathica Vitamin K Brightening Eye Serum? What’s to highlight about its formula? How to get the best out of the eye serum? What’s to like best? Is there anything to hate about it? You don’t have to sleep 10 hours in order to get well-rested eyes or to eliminate dark circles under your eyes. Sometimes, no matter how much work you put into it, having nice and glowing skin around the eyes seems like mission impossible. We’re not saying that getting enough sleep is useless, we’re just confirming the reality that, from some point in your life, that alone doesn’t help that much anymore. No face cleanser or high-quality moisturizer is going to work amazing for the eye area. 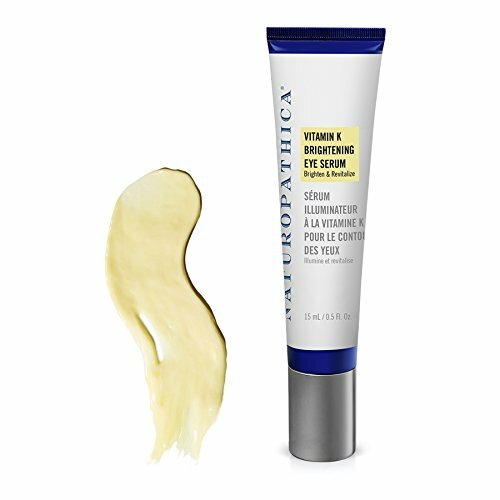 An eye serum like Naturopathica Vitamin K Brightening Eye Serum is especially made for this sensitive area of your skin, improving its appearance and keeping it younger looking for a good amount of time. The illuminating eye serum is going to reduce the visibility of dark circles and fine lines, diminishing the wrinkles too. Even though the serum isn’t going to make you like you’re in your twenties once again, it’s going to give the eye area a nice glow and a youthful feel, which is not very easy to accomplish with just some good overnight sleep. The serum works mainly because of its formula which is based on numerous natural ingredients that we already know that make skin look younger and healthier. Camellia oil-is an incredible ingredient for the skin as it has anti-inflammatory ingredient which makes it an efficient agent for stopping the aging of skin. Grape seed oil-has anti-oxidant properties so it’s able to protect the skin from sun’s bad UVs. It’s an important ingredient when addressing melasma and makes your skin look younger altogether. Vitamin K1- speeds up the healing of damaged skin. It also increases the elasticity of skin and improves the appearance of dark under-eye circles. Sea buckthorn fruit oil-controls acne and reduces the visibility of wrinkles. It sooths the dry eye area as well. Safflower seed oil-eliminates dryness and roughness in skin. It eliminates the dirt, impurities and excess oil from skin and comforts skin in psoriasis, eczema and acne. It raises the skin’s elasticity and leaves the skin hydrated. Elderberry fruit extract-fights against aging and keeps the free radicals at distance. It’s a detoxify agent that minimizes the risk for breakouts, scars and boils. It boosts your skin’s health and protects the skin. It reduces inflammation and bruising, bringing relief for skin. Rosehips-eliminates dullness from skin and addresses the acne-prone skin. It brightens the skin and evens out your skin tone. It smooths out scars and moisturizes the skin. It exfoliates the skin and increases its elasticity too. Horse chestnut- sooths the skin in eczema and minimizes skin symptoms in various conditions. Ginkgo biloba leaf-has antioxidants compounds so it protects the skin against aging, reducing the visibility of wrinkles and fine lines. It helps the oily skin and the clogged pores. It’s a safe ingredient for the sensitive skin and cleans up the skin, removing impurities, oils and debris. Coneflower-keeps acne under control and minimizes the wrinkles. It calms the scorching skin and sooths the irritated skin. It heals the damaged skin and boosts the cellular regeneration. It also reduces inflammation and calms skin in eczema and psoriasis. You should include the eye serum in your daily skin care routine. Some even use it twice a day, AM and PM, but you’re going to have to pay attention to your skin. The serum is powerful and can cause unpleasant feel if used too much. Apply only a small amount of the serum under the eye area. The area has to be well cleansed and dry. Use your fingertips and lightly dab the serum until the absorbance is complete. The serum gives fast results and a nice glow to your skin. It has a sweet and herbal scent that doesn’t stay for long time on skin. Loaded with natural ingredients and improving the skin around the eyes, the serum is a valid choice that you shouldn’t miss out on whenever in need. Recent reviews on Sugar & Fluff Beauty: the Tata Harper Regenerating Cleanser, the Tula Probiotic Skin Care Illuminating Face Serum, the Tula Probiotic Skin Care Purifying Face Cleanser, the Naturopathica Argan & Retinol Wrinkle Repair Night Cream, the Naturopathica Calendula Essential Hydrating Cream Review.